I wasn’t entirely sure what to expect when I signed up for a vegan barbeque cooking class at the Stanford Inn by the Sea last spring. 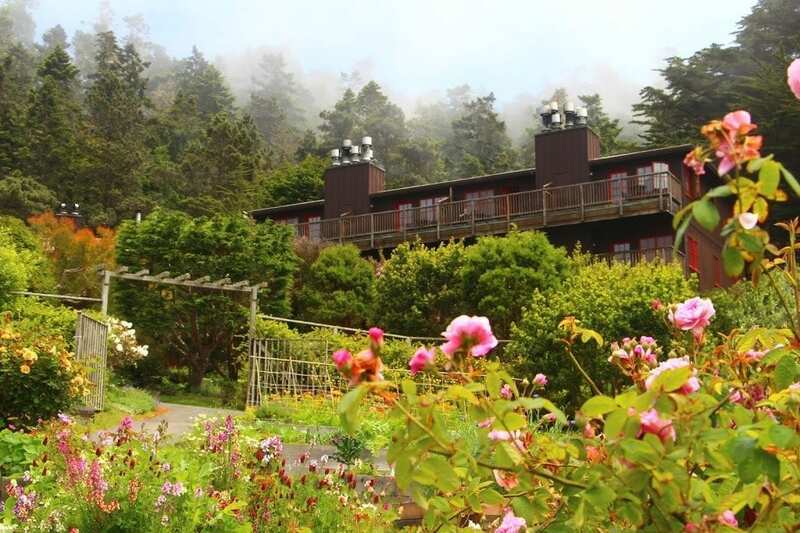 This venerable eco-resort on the Mendocino Coast offers a myriad of wellness programs in yoga, Tai Chi, Chinese medicine, meditation, art therapy, gardening, nutrition, and vegan cooking. I’m keen on learning plant-based preparations because I have a number of family members and friends who have different food allergies and have to adhere to various diets. Plus, “vegan barbeque” sounded like an oxymoron, so I had to check it out. 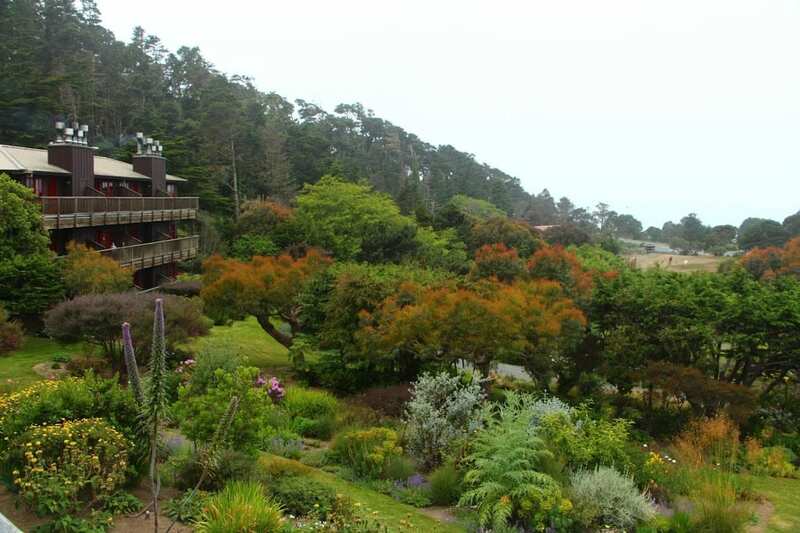 The inn is nestled on a 10-acre hillside overlooking the Pacific Ocean. 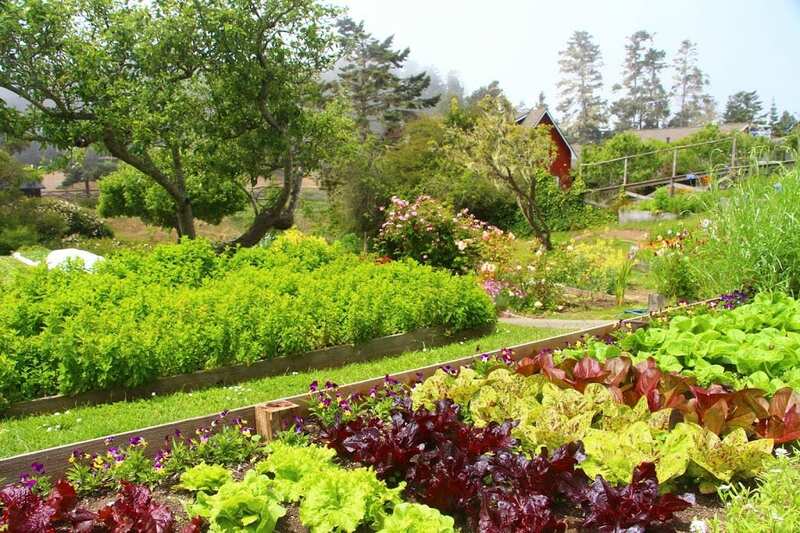 The driveway leads past a cascade of organic vegetable gardens, flower gardens, and orchards—all of which are farmed using sustainable, bio-intensive methods. The inn’s gardens and greenhouses provide the signature ingredients for the inn’s critically-acclaimed vegan restaurant—Raven’s Restaurant—and for the vegan cooking classes held nearly every week of the year. Thin swaths of coastal fog drifted toward the tree tops as I followed the drive up to the inn. The inn itself is a handsome collection of wood buildings perched on the hillside. Painted dark brown with bright red trim, the buildings contrast beautifully with the verdant gardens and the trees. Inside the main lodge, the cooking classes are taught in the dining room of Raven’s Restaurant, which offers walls of windows with gorgeous views. Jeff Stanford, who has owned the inn with his wife Joan since 1980, greeted me and introduced me to the class instructor, Sid Garza-Hillman. Any trepidation I may have felt about taking my first vegan cooking class completely flew out the window upon meeting Sid. He’s a tall, bald, skinny guy with a cartoonish grin and a disarming sense of humor. Originally from Los Angeles, he had spent his first decade out of college as an actor and musician, fronting an alt-country band called The Sid Hillman Quartet. He’s now a certified nutritionist, health coach, and the Programs Director at the Stanford Inn’s Mendocino Center for Living Well. Over a dozen students had gathered for the class. Some were locals who had taken several of the inn’s cooking classes in the past. 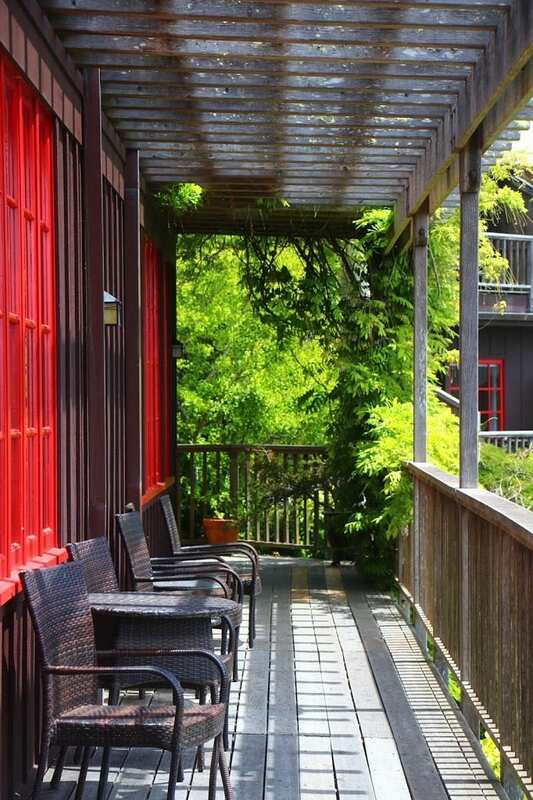 Others were guests of the inn who had traveled to Mendocino with their families. Some were vegan, some were not. Most were taking the class to learn preparations that would aid them in preparing foods for their own diets or a family member’s diet. With an apparent fondness for an audience and a comic’s touch, Sid opened the class by demonstrating knife skills and how not to cut your fingers off. He chatted about his philosophy favoring whole foods over processed foods. Instead of barbequed tofu, for example, we’d making barbequed portobello mushrooms. (An aside: Raven’s Restaurant serves a barbequed “pulled mushroom” that patrons believe is actually pork.) In addition to being vegan, all of the dishes we were making that day—the portobellos, baked beans, creamy tahini cabbage slaw and jalapeño cornbread—were also gluten-free. We jumped right in with chopping and sautéing onions for the barbeque sauce. Then we added tomato paste and the spices that would give the sauce depth and a bit of kick. For the balance between tangy, sweet, and salty, we added apple cider vinegar, Worcestershire sauce, orange juice, maple syrup, molasses, tamari, and salt. 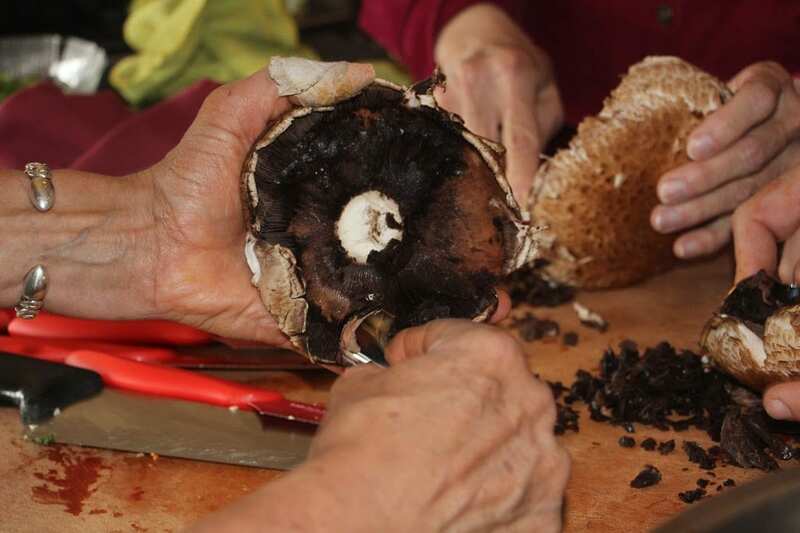 While the sauce simmered, Sid showed us how to remove the dark gills from the underside of the portobelllo mushrooms by scraping them out with spoons. While there’s nothing wrong with eating the gills, some people find the mushy texture unappealing. Plus, the dark color of the gills can leach into whatever dish you are preparing. Once the barbeque sauce had cooked down, Sid gave it a whirl in a high-speed blender. We then basted the mushrooms with the sauce and popped them into the oven. The same barbeque sauce was used as a key ingredient for the baked beans. The recipe called for pinto beans, the barbeque sauce, and a little more maple syrup, molasses, tomato juice, apple cider vinegar, smoked paprika, and black pepper. I was thrilled with the results. The beans had a great smoky/slightly sweet/slightly tangy taste that reminded me of my mother’s baked beans. 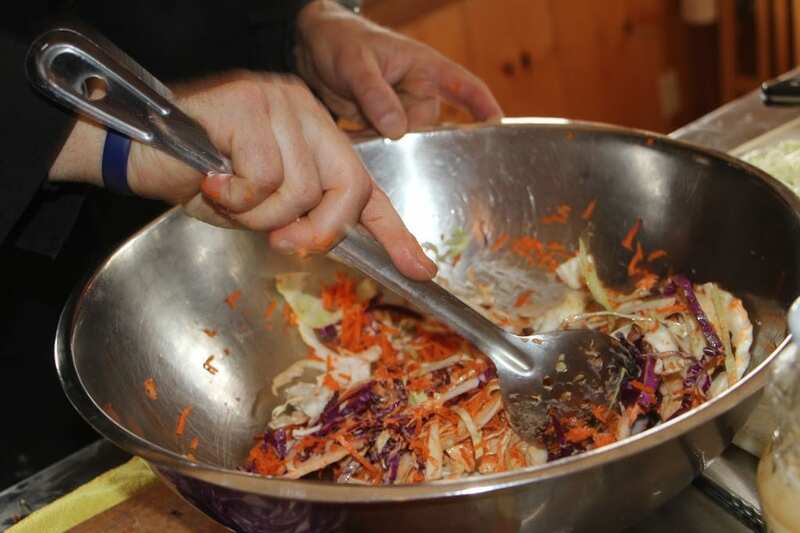 For the slaw, we combined both red and green shaved cabbage, julienned carrots, and tahini. From there, Sid encouraged us to add several other ingredients to our own taste: paprika, marjoram, Ume plum vinegar, and lemon juice. He also suggested thinning it out, if needed, with water. The creaminess from the tahini combined with the other ingredients made for tasty side dish with fresh, crunchy vegetables. 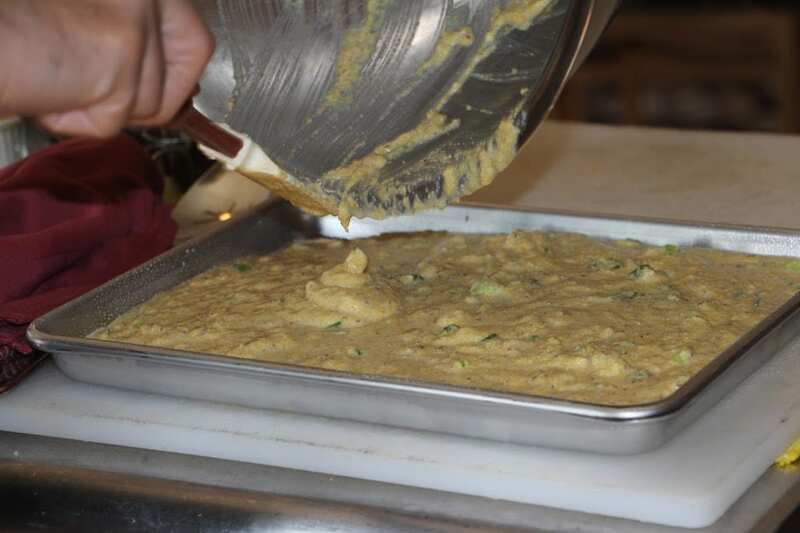 Preparing the vegan (and gluten-free) jalapeño cornbread provided insight on using egg substitutes. Sid’s recipe for egg replacements calls for combining 1 tablespoon of flaxseed with 3 tablespoons of water and whisking to a gel. While most of the other ingredients for the cornbread were standard, a few others surprised me; notably a small amount of apple sauce and apple cider vinegar. When we sampled the cornbread out of the oven, I was impressed. It had a moister texture than I had expected, wasn’t too crumbly, and the scallions and jalapeños balanced the cornbread’s slightly sweet flavor. Sid proclaimed our cornbread to be better than the cornbread the restaurant was serving that night. When the barbeque-slathered portbello mushrooms came out of the oven, Sid gleefully instructed the class to “cut them on the bias like a steak.” The vegans in the class just blinked a few times. With an exasperated laugh, he proceeded to demonstrate how to slice the mushrooms diagonally into strips. We finished cutting our barbeque portobello “steaks,” served up the baked beans, slaw, and cornbread, and then sat down to enjoy our vegan barbeque just as the sun broke through the fog. 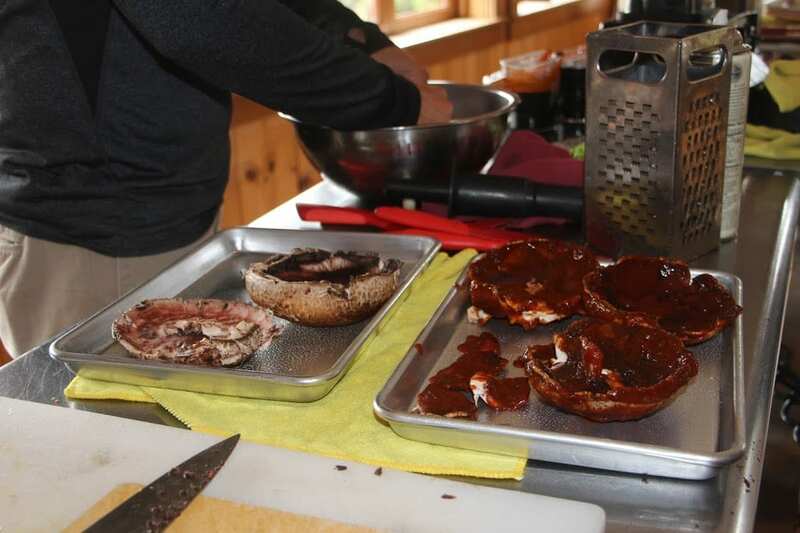 Stanford Inn-by-the-Sea’s next barbeque cooking class will be held on Saturday, June 4, 2016. Other upcoming group cooking classes include burgers and picnic sides, heirlooms from the garden, gluten-free baking, and vegan cooking intensives. For a full calendar of classes, visit http://livingwellmendocino.com/calendar/. Group classes are $45 per person. 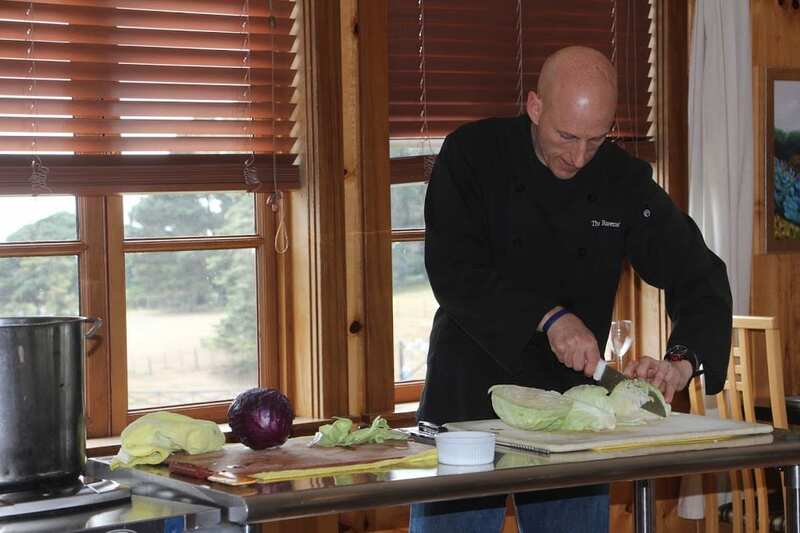 In addition to the group classes, private cooking classes are also available. Topics include creamy vegan soups and cheeses, vegan baking and deserts, vegan sauces, dips and dressings, and more. The private classes are available daily beginning at 1 p.m., but must be reserved in advance. Private classes are $85 per person, $115 per couple, or $65 person for groups of three to six people.